With fiber optics, the tolerance to dirt is near zero. Airborne particles are about the size of the core of SM fiber and are usually silica based - they may scratch PC connectors if not removed! Patch panels have mating adapters that can become contaminated if left open to the air or scrape off foreign particles under repeated usage. Test equipment has fiber-bulkhead outputs that need periodic cleaning, since they may have hundreds of insertions of test cables in short time frames. We recommend you always keep dust caps on connectors, bulkhead splices, patch panels or anything else that is going to have a connection made with it. Not only will it prevent additional dust buildup, but it will prevent contamination from being touched or damaged from dropping. Always clean connectors before mating, whether for testing or making network connections. When testing, we recommend that connectors on both the reference and tested cables be cleaned before every test, as every time the connector is exposed to air, it can accumulate dust. Typical airborne dust is almost the size of the SM fiber core, so cleaning every time is even more important than MM. A secondary effect is that if the connectors are dirty, it can scratch the end finish (most dirt is silica (sand) based) and cause higher reflectance if not loss. There are several types of cleaners which can be used. We recommend using commercial fiber optic cleaning kits whenever possible. Many companies sell cleaning kits for fiber optics, including AFL, NEPTEC, Chemtronics., NetOptics Etc. They are readily available from distributors. Some are dry, some use cleaning solutions. They are all good solutions if you follow their directions. We have links to them on this page and in the "Worth Reading" section of The FOA Online Newsletter. 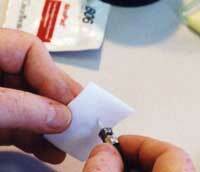 solvents MIGHT attack epoxy, so only reagent-grade 99% isopropyl alcohol should be used. Never use cotton swabs or cloth ­ it will leave threads behind. Alcohol may leave a film if not dried off completely. Clean and dry the end of the ferrule just before insertion. 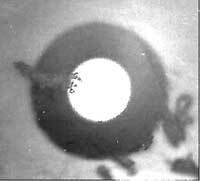 Some optical cleaners for lenses may leave residues. Residues usually attract dirt and make it stick. We have used Alco Pads which are pure isopropyl alcohol on lint-free pads for over 20 years with no problems. However, you must dry the ends after cleaning. After the alcohol evaporates from one of the pads, they are good to dry the ends of the ferrules after cleaning. A better way to clean these bulkheads is to remove both connectors and clean with Alco Pads, then use a swab made of the same material with alcohol on it to clean out the bulkhead. Detectors on FO power meters should also be cleaned occasionally to remove dirt. Take the connector adapter off and wipe the surface, then air dry or dry with a lint-free wipe. Ferrules on the connectors/cables used for testing will get dirty by scraping off the material of the alignment sleeve in connector mating adapters. Some of these sleeves are molded glass-filled thermoplastic and sold for multimode applications. These will give you a dirty connector ferrule in 10 insertions. You can see the front edge of the connector ferrule getting black. The alignment sleeve will build up an internal ledge and cause a gap between the mating ferrules - creating an attenuator! Use the metal or ceramic alignment sleeve bulkheads only, especially for testing where you have repeated insertions. Cleaning contaminated connectors requires aggressive scrubbing on the ferrule sides with the AlcoPad and discarding the mating adapter. Typical microscope view of dirty connector before cleaning courtesy Eric Pearson, Pearson Technologies. Cleaning a connector with an "Alco Pad"